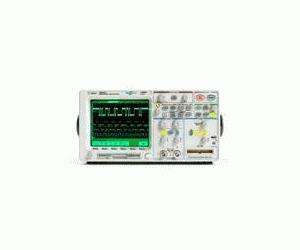 The Agilent 54641D 2+16 channel, 350 MHz Mixed-Signal Oscilloscope (MSO), with two scope channels and 16 logic timing channels, uniquely combines the detailed signal analysis of a scope with the multi-channel timing measurements of a logic analyzer. It lets you trigger on and view the complex interactions among your signals on up to 18 channels simultaneously. No more guesswork and no more poking around to see a few channels at a time. The 54641D is ideally suite for CPLD and MCU based applications.